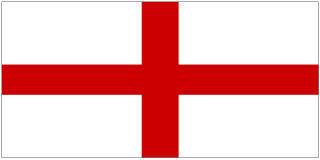 The National flag of England, commonly knows as the St George’s cross, consists of a red cross on top of a white field. Although the flag has no official status within the United Kingdom, it is being used increasingly, primarily at sporting events. The flag can be traced back to the crusaders in the Middle Ages that adopted it as their symbol. Get the kids to try their hand at some patriotic acrostic poetry, and use our printable page, complete with the St George's Cross, to display it! Choose from four versions below. Print this page and then fold it up into a useful little booklet, for storing facts about England and the England flag! Booklet folding instructions here. Enjoy these free England bookmarks to print for kids. They feature the English flag (St George's Cross) and come in four variations, including 2 which the kids can colour in. Print out as many pages as you need and string up some England flag bunting! We've included a flag at the top to make the bunting easy to hang over a piece of string or ribbon. Alternatively, attach to a straw or chopstick for waving arouind! The England flag is a nice simple flag to colour in - and you'll only need one red pen or crayon! Help children learn the England flag with the help of our printable jigsaw! You will need our instructions and cutting guides, but it only takes a moment to prepare. We have five sizes of England flag in the pdf below, ranging from A4 size down to a useful mini flag! Because you never know when you might need an England flag - we have one here that you can print! Use our notebooking pages to write about England or the English flag. Notebooking page 1 has space for an illustration of your own or a picture to be stuck on. Print out this England supporter poster, ready for the next England match! It's coming home ... it's coming home ... Football's coming home ... How many of us are singing along with that old song right now? The kids can join in the fun with this new colouring page, keep their fingers crossed and enjoy the football! Do you think 2018 is the year that it's finally coming home? Support the England team in the World Cup with this fun poster. You could even reverse the page, print it onto transfer paper, and make a T-Shirt to wear while watching. We've provided an A4 poster and a double A5 poster too. Print out some cheerful St George's Day mini bunting which alternates the England flag with fun pictures of Saint George, an English rose and the three lions royal arms.